Our final episode from TKPT St Maarten will be here tomorrow, complete with the final results of the three day tournament. 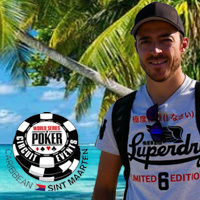 In the meantime, here's an interview with John Curcuru, one of five online players that won their way to TKPT St Maarten in satellite tournaments at Intertops Poker. He played a lot of poker over 3 days. One of the most interesting hands was with Chris Perkins, another Intertops satellite winner. More to Life than Poker! ?